You've got to give it to K.B. ; he can certainly get the money and the talent together to bring off a feat like this. Deliver the goods he does, in his own inimitable fashion. An assembly of stars rarely to be seen in a classic on the screen (and amicably receiving smaller salaries than usual) means that anyone seriously interested in literature or film must unquestionably see this version of possibly Shakespeare's most noted play. Branagh managed to convince Castle Rock to release a 70 mm full-length version as well as the 35 mm edited version. He argued that, "By filming the entire play, you have Shakespeare's complete entertainment. I do not want the audience to be filled with dread by the fact that we are using all of the text. In practice, it's a bonus. There are so many additional exciting elements to take advantage of." And, of course, there's lots more Branagh time on screen as well, since he has proven sufficiently demure to interpret the title role himself and treat us to a display of his myriad talents once again. What, some of you may ask (frightening to contemplate) is "Hamlet" about? Simply stated, it's the story of the Prince of Denmark seeking revenge for his father's murder by an uncle who has, after the King's death, married Hamlet's mother. You might also describe it as a ghost story with lots of intrigue and murder. On the other hand, you could consider it an allegory of one man's mind filled with torment and philosophy. Needless to say, it is too complicated for the confines of any brief review to attempt an extensive explanation or analysis of the piece, especially taking into consideration that scholars have not yet finished arguing interpretation or attempting to claim the final word after 400 years. Let it suffice to suggest that you should see the film and decide for yourself. And now for the list of luminaries paraded by for your enjoyment: Julie Christie is a sensitive and intelligent Gertrude (and one might not expect otherwise); Kate Winslet is convincing as the confused and somewhat frightened Ophelia (who couldn't resist Millais); Billy Crystal pops up, so to speak, as a wry and clever gravedigger (for a last laugh); Judi Dench gets a chance to go eccentric (dare I say?) as Hecuba; Robin Williams spins staunchly through as Osric (very Robin); Sir Richard Attenborough fits nicely into the costume of the English Ambassador (and who would have thought it of Pinkie Brown? ); Brian Blessed uses his subtly curved flamboyant tongue to embody the Ghost (also fitting); Richard Briers is delightful as a thoughtful and provoking Polonius (not in the normal mould); Gerard Depardieu strikes a pose (a big one) as Polonius's servant Reynaldo; K.B., of course, is the boy in black. Is there anyone, you may ask, who wasn't available to put in an appearance during the shooting schedule. If so, included among the missing were not Reece Dinsdale, Nicholas Farrell, John Gielgud, Rosemary Harris, Charlton Heston, Jack Lemmon, Rufus Sewell, John Mills, Nick Farrell, Timothy Spall, or Michael Maloney. With so many bodies covering the floor, what else would you expect but silence? 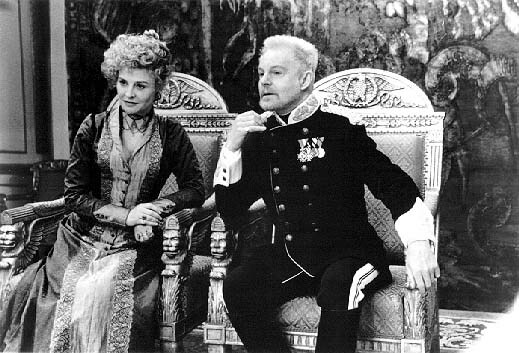 Star-studded it certainly is, but Derek Jacobi's performance as Claudius (cast, to some degree, against type) remains shining brightest as he unquestionably delivers the strongest moments in the film. Jacobi's own performance as Prince Hamlet for the BBC-TV Shakespeare series (previously performed on-stage) some years ago was also a notable achievement and quite possibly the best performance of that entire series. This one-time tutor of Branagh has such overwhelming talents as an actor that one almost regrets his performance as the Danish prince has not been captured for posterity on 70 mm film. Nevertheless, here he is in all his glory as the Prince's murderous stepfather. The mirrored doors, which were also extremely effective in the BBC version with Jacobi, make their reappearance as a set piece in Branagh's new version. Do not mistake my words, this is the first epic wide-screen 70 mm film to be shot in England for 25 years and that alone makes it an event. As true as it may be that Branagh has proven himself both a remarkable director and a talented actor, the two do not seem capable of working together at optimum standard. On the other hand, he has the know-how and ability to motivate a cast and crew that was willing to realize 5 pages of script each day in order to produce a 4 hour film within the short period of ten weeks; not, to say the least, the easiest of tasks. No wonder they showered him with rose petals. The other star of the show is Tim Harvey, whose production design is visually striking with an impact rarely experienced on the silver screen. Each and every chamber has a feeling of it's own, readily associated with the characters and reflecting them in the slightest of details. The opulence of the Scandinavian neo-classical surroundings seems the only reason to choose the 19th century as period for the action. Handled beautifully in its entirety by DP Alex Thomson, the endless mirrors alone must have presented some logistical nightmares during production. One really shouldn't miss it.